At some point in your foreclosure-investing career you will feel competent enough to go after investor capital. And when you do, you will need to show your prospective investors a worksheet of how the profit is computed and divvied up. 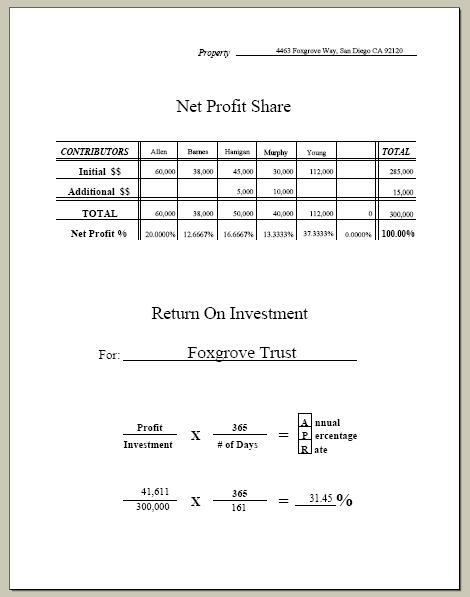 Years ago we had to develop such a form, and also a worksheet that calculates the return on the passive investors’ capital (ROI). To save you some time and energy we’re willing to share our handiwork with you. For demonstration purposes, the forms in this article are filled in. And though they depict a real transaction of ours, the names involved have been changed. 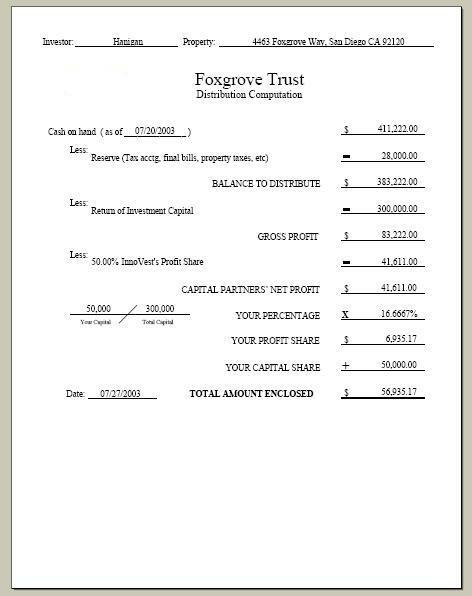 And yes, you will find blank, ready-to-use masters in the “Fillable Forms” section of our website at www.foreclosureforum.com. You’ll notice that we employ a 50/50 profit split between our passive, cash investors and ourselves. But that profit ratio isn’t chiseled in stone anywhere. So feel free to fill in the blank forms any way that works best for you. Take notice that we played two roles in this deal…that of a capital investor and that of the hands-on, organizer/manager. And so, we were entitled to our prorated share of the investors’ profit, along with our 50% syndicator’s share.